Disclaimer: The aim of this post is to be humours, though all the facts and arguments are true and valid. While this uses mathematical set theory to discuss an argument, no formal research or calculations have been performed for this, the theory is that the discussion should be valid and the statistics can be applied at a later stage. I have now been single for a while, and that doesn’t look like it will be changing any time soon (spoiler: or ever). There are many reasons why this is the case, but I though I would outline some of the basic reasons in a logical/analytical way, as that is how my brain works. When it comes to love and relationships (the softer things) most people are unable to think logically; sadly, this is the only way that I can think. This though yields some interesting revelations, that people often try and dismiss, but the truth of the matter is that the facts and maths is there to back it up. Depending on the interest that this generates, I might also publish some other thoughts on the matter (probability and availability distributions etc). The idea of this post is to try and get the information out there, and stimulate discussion. I believe that the logic is sound and undeniable, but would love to here a logical argument from someone proposing something different. As discussed, I am single. Because of my work, personality, hobbies, friends and a myriad of other circumstances this has been the case (and will continue to be) for a while. With that said though, solving the problem of a finding/starting a relationship is a difficult one. In future posts I might talk about some of the timing related issues, and the costs involved, but the initial problem can be thought of in terms of sets. If we think in terms of set theory, with the universal set being every person in the world, we can easily begin a set reduction to determine the pool of potential candidates. This activity can be continued, applying various filters until we find the actual valid matches; as we are talking a logical approach, we will ignore people that won’t result in proper, long term or satisfactory relationships. The first problem that arises is fairly simply to discuss, the full set contains many people who need to be excluded and for the first pass we can look at some basic, solid criteria. 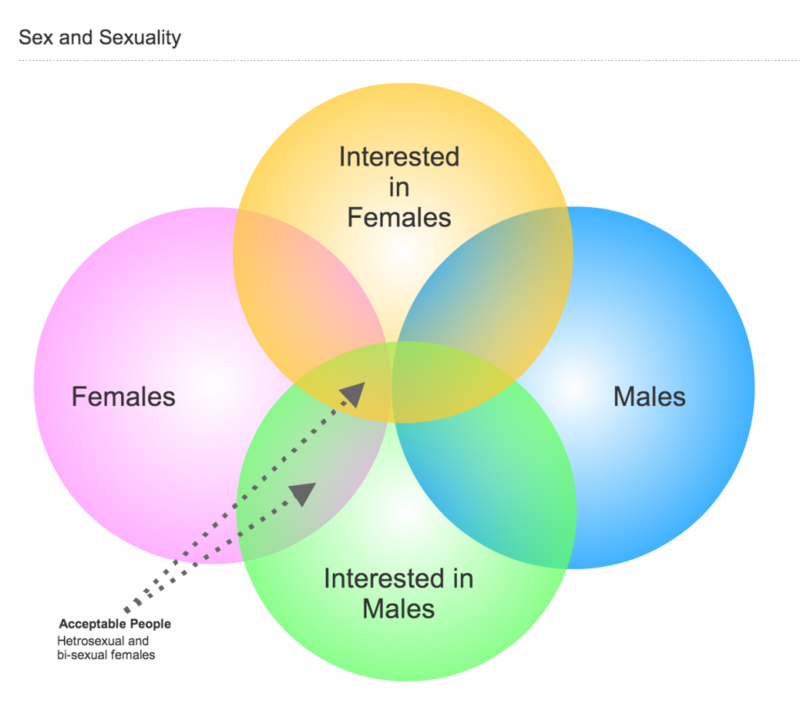 There are two separate sexes (male and female) and for arguments sake we will say two different sexual preferences (towards males and towards females). 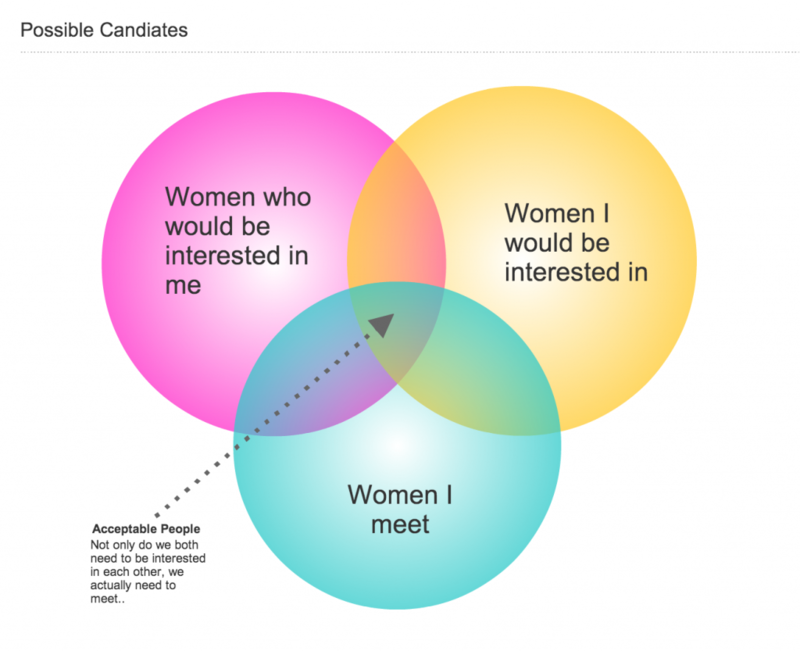 From this the only possible candidates are females interested in males, this includes females that are interested in females as well. This might seem a little obvious, but it bears mentioning, as restricting my search to females immediately removes 50% of the total population. Special note: I’ve ignored the potential overlap of the male and female genders and individuals existing outside of these boundaries as they can probably safely be excluded from this discussion (and probably wouldn’t be present within a sample set unless it was extremely large). Aside from the black and white definition of sexual preferences, there also needs to be some more considerations, the preference towards each other. Before even getting into the specifics of a persons fit, and engaging in a relationship there needs to be sufficient interest (so that things can start and grow). For a relationship to work, but both parties need to be interested but also along with that they both need to actually meet. As I live in one location and don’t travel around the world this drastically reduces the potential pool of people. There can be relationships where one party isn’t interested in the other (at least initially), but they generally aren’t sustainable or long lasting and must be disregarded for this exercise. So far all of the discussions have just been around viable candidates, we also need to consider that the person is right for me. Finding the right person is an extremely difficult thing. I could discuss all the tiny little conditions and features I want, but I think we can kind of boil it down to 3 things: Someone I am attracted physically (it sounds shallow, but it’s the reality of it, I’d have to stare at them all the time), someone I’m attracted to mentally (I have a unique personality, as does everyone else, and these would need to align) and finally someone with similar interests (they don’t have to all be exactly the same, but there need to be some commonality). Often relationships don’t meet fit into the intersection of all of these, and end up failing (people often cite just not having anything in common, or being different people). Even knowing that the right person exists isn’t enough, for a relationship to occur there’s other conditions that need to be met. As with most of the points discussed so far, these may seem pretty obvious, but need to be stated. In addition, these conditions have the caveat that they are also temporal (ie need to be valid within the right window and stay valid). 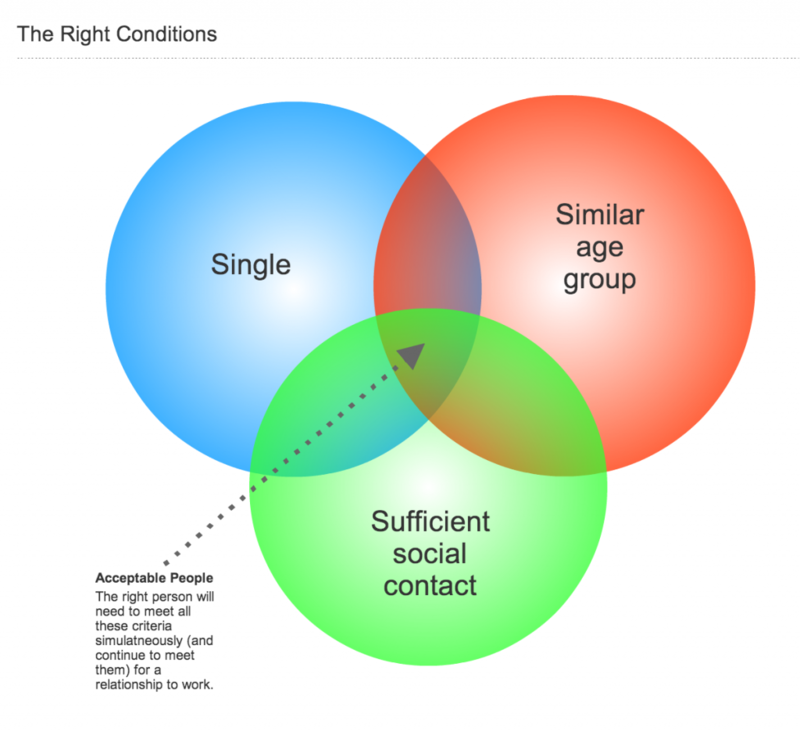 If the right person exists but they are not single, or they are in the wrong age group (outside of societal conventions or legal limits or just to a degree that would make things unfeasible) or you never actually get to spend any time with them (either before or during the relationship) it won’t work. As stated, the issue with these conditions is that they are temporal; having to all occur at the same time and be maintained. For example if the right person is not single and doesn’t stay single very long, it only gives someone a small opportunity for the relationship. Generally when someone starts to talk about the perfect woman, or what they want in a woman it seems pretty unrealistic quite quickly when you get too specific with the details, you need to ensure things are within the confines of reality (i.e. if you will only date people who are exactly X cms tall, have blonde hair, blue eyes and a tattoo of a tiger on the left shoulder you are almost limiting the set to a single person… or no one). 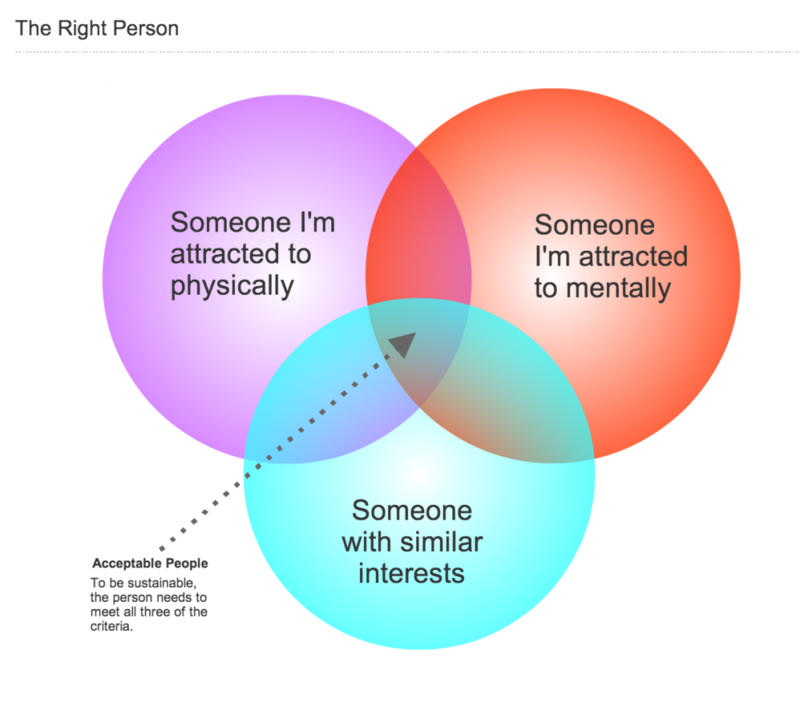 I believe though that the criteria I have outlined above is quite realistic; someone who is single, someone who I’m attracted to, someone who I can actually meet etc. The problem though is that the right person is at the intersection of all these criteria, and when you start to think about the actual size of the sets, and the intersection, the number of people starts declining extremely quickly. From where I am sitting right now (at work) I can see quite a few females, though most of them are not single, outside of the age range I would like or I am just not attracted to (eg I hate to be shallow but if someone weighs double what I do I’m really not interested); in fact none of them are that right person. Expanding out on that and thinking about all the people I am likely to meet, the standard probability that people I meet fit the various criteria and that rate at which those overlap the prognosis starts to look really grim. I’ve never actually done the math on this (plugged values/probabilities into the sets described here) but it’s pretty easy to set that the target set is very small. I’m not saying that the right person doesn’t exist, in fact they probably do (when you think of all the permutations of different people out there), but existence isn’t enough. On top of existence you need to factor in the chance of meeting, forming a relationship, while the right conditions are met…. And I believe the chances of that are so small that they can be considered “Statistically Insignificant”. Sure, most people will say things like “your soul mate is out there”, “love finds a way” and “things work out in the end”, but when you look it from a logical and analytical perspective, the facts don’t lie. If you’ve gotten this far (firstly congratulations) you would probably be interested to see some of the things that motivated me to do this and that helped in building my argument. The majority of this just came from my brain…. It’s a scary place and you really don’t want to go in there, but maybe over time I’ll let out some controlled outbursts like this (I have some other ideas for similar posts such as “availability/time – why your first choice matters” and “Relationships vs Prostitutes – A Cost-Benefit analysis”). I’m generally willing to discuss these matters, as I find these kind of in depth logical discussions interesting. In addition there was a great XKCD article discussing soul mates, it can be read here: http://what-if.xkcd.com/9/ , it talks about how the world would work if we had one single, perfect soul mate. Definitely worth a read, as are the other articles they have up there. There is also a great song by Tim Minchin (which is referred to from the XKCD article); “If I didn’t have you”. It can be found on youtube on Tim’s official channel (or you can see the version linked to from the XKCD article here: http://www.youtube.com/watch?v=Gaid72fqzNE ). This song discusses the fact that if Tim didn’t have his wife he would probably have found someone else sufficient (though differing in their qualities). One of my favourite lines from the song is “I don’t think you’re special… Well you’re special, but you fall within a Bell curve”. Definitely worth a listen. Thank you for reading this random jumble of my thoughts. Hopefully there weren’t too many mistakes and you were able to put up with the terrible them of my blog (one day I’ll change it to something good… I swear). I hope it made sense and you leave a little more educated, analytical and probably more jaded now you know the truth.